Lauren Kate earned her M.A. in Creative Writing at UC Davis, where she also teaches. She lives and writes in an old farm house in Winters, California. Learn more at Lauren Kate’s website. Fallen — (2009-2015) Young adult. Publisher: There’s something achingly familiar about Daniel Grigori. Mysterious and aloof, he captures Luce Price’s attention from the moment she sees him on her first day at the Sword & Cross boarding school in sultry Savannah, Georgia. He’s the one bright spot in a place where cell phones are forbidden, the other students are all screw-ups, and security cameras watch every move. Even though Daniel wants nothing to do with Luce — and goes out of his way to make that very clear — she can’t let it go. Drawn to him like a moth to a flame, she has to find out what Daniel is so desperate to keep secret… even if it kills her. 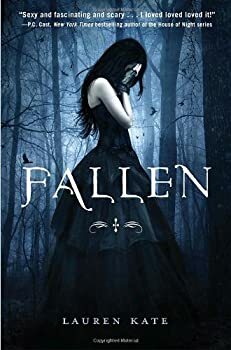 Dangerously exciting and darkly romantic, Fallen is a page turning thriller and the ultimate love story. Lucinda (Luce) Price has always been a little strange. She sees malevolent shadows that other people can’t see. After a mysterious fire in which the boy she was with died, she is sent to a reform school in Savannah. On her first day she falls for a gorgeous but aloof boy who seems to want nothing to do with her. His name is Daniel Grigori (no kidding). But Cam, the other gorgeous (and very popular) guy at school, immediately starts pursuing her. Luce is confused by her feelings toward Daniel and alarmed that the shadows are appearing more frequently. With the help of a classmate, she sets out to discover who Daniel Grigori really is. Teardrop — (2013-2014) Publisher: The first in a new series by Lauren Kate, the #1 New York Times bestselling author of the Fallen series, TEARDROP is an epic saga of heart-stopping romance, devastating secrets, and dark magic… a world where everything you love can be washed away. Never, ever cry…. Eureka Boudreaux’s mother drilled that rule into her daughter years ago. But now her mother is gone, and everywhere Eureka goes he is there: Ander, the tall, pale blond boy who seems to know things he shouldn’t, who tells Eureka she is in grave danger, who comes closer to making her cry than anyone has before. But Ander doesn’t know Eureka’s darkest secret: ever since her mother drowned in a freak accident, Eureka wishes she were dead, too. She has little left that she cares about, just her oldest friend, Brooks, and a strange inheritance—a locket, a letter, a mysterious stone, and an ancient book no one understands. The book contains a haunting tale about a girl who got her heart broken and cried an entire continent into the sea. Eureka is about to discover that the ancient tale is more than a story, that Ander might be telling the truth… and that her life has far darker undercurrents than she ever imagined. The Betrayal of Natalie Hargrove — (2009) Publisher: A steamy Southern beauty makes one fatal mistake. Natalie Hargrove would kill to be her high school’s Palmetto Princess. But her boyfriend Mike King doesn’t share her dream and risks losing the honor of Palmetto Prince to Natalie’s nemesis, Justin Balmer. So she convinces Mike to help play a prank on Justin… one that goes terribly wrong. They tie him to the front of the church after a party — when they arrive the next morning, Justin is dead. From blackmail to buried desire, dark secrets to darker deeds, Natalie unravels. She never should’ve messed with fate. Fate is the one thing more twisted than Natalie Hargrove. Cruel Intentions meets Macbeth in this seductive, riveting tale of conscience and consequence. CLICK HERE FOR MORE STORIES BY LAUREN KATE.